One of the biggest factors and influences creating problems is the green movement and the use of recycled content in carpet tile backings. Carpet tiles have always been a challenge to manufacture and curling has been part of the learning curve for years. Curling would come and go as manufacturers learned about stabilizing the product. Today with the race to be green every manufacturer is working on ways to use recycled materials. We’re in one of those learning curve phases of product development. This is unique because the driving force is the same for all carpet tile manufacturers; be green, use recycled content and make the product recyclable. This is a tall order and one that the industry doesn’t have a real strong grip on right now because we are still on a learning curve. As a result we’re seeing claims coming in daily on almost every manufacturer’s carpet tile product for curling edges. One of the responses from manufacturers is that the installers didn’t use enough adhesive. The adhesive used on carpet tile is pressure sensitive and it’s only supposed to stabilize the product on the floor laterally. It is not supposed to stick it to the floor to make it lay flat. Etch this statement in stone, “carpet tile, out of the box, is supposed to be flat, square and stable.” This is an indisputable fact. Glue is not supposed to keep carpet tile flat nor make it so. If you take a carpet tile out of the box, lay it on a flat surface and let it relax, it should do so without any edge curl. If the edges curl the tile is inherently unstable, which means the curl is built into the tile. This isn’t intentional but it indicates an instability in the tile. No elaborate testing is necessary to prove this physical characteristic as it is the law of physics at work. For every action, in this case an uneven stress level in the layers of the tile, there is an equal and opposite reaction, which is the curling of the tile edges. If you cut a small square out of the middle of a curling carpet tile and lay it on a perfectly flat surface, like a glass top table, that small square’s edges will also curl. This lends further credence to the built in stress. We’ve had flooring contractors calling from all over the country lamenting about this problem. In fact as I began writing this column I got a call from one about a problem he has with curling carpet tile, amazing. 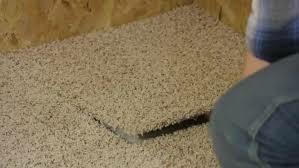 There is no acceptable level of carpet tile curl, nor is there an industry tolerance for it. Carpet tile must lay flat, be square and be stable out of the box. Adhesive will not, nor is not supposed to stick it flat to the floor. You could bolt a curling tile down and where it wasn’t bolted it would curl. This is not an installation problem, a moisture problem or any other type of problem. It’s a carpet tile problem, plain and simple. If you need help with a carpet tile problem call us. No one knows more about this than LGM; that I can promise you.